The department was formed in 2013 on the initiative of Oleksander S. Chirkov, Doctor of Philology, Full Professor, member of Ukrainian Academy of Sciences, and Honorary worker of General Education of Ukraine. This was the process of merging of the Department of Romance & Germanic Literature and Literature Studies with the Department of German Language. The history of the former department of the German language begins in 1949. The first head of the department was Malinovska M. V., later the department was headed by Bakulin N. D., Weidman M. Y., Byrdova N. M., Petynov, V. M., Pryschepa V. Y., Sokolovska S. F. Knowledge and experience for many years was masterfully shared by Golovinska M. I., Polischuk G. A., Zhytkevych L. I., Dinova S. Y., Yarv L. M., Vorobyova N. Y., Pryschepa V. P., Dmitruk K. M., Ryabushchits V. G., Grechina L. B. After the merging of two chairs the Department of Germanic Philology and Foreign Literature was founded. Up to 2018 the head of the department was Oleksander S. Chirkov, Doctor of Philology, Full Professor, member of Ukrainian Academy of Sciences, and Honorary worker of General Education of Ukraine. From 2018 the head of the Department s the Candidate of Philological Sciences, associate professor Lipisivitsky M. L.
The department offers postgraduate and doctorate courses, as well as Specialized Academic Board on specialty 10.01.06 — Theory of Literature. In May 2015 the doctoral dissertation was defended by Astrakhan N. I. In 2012 and 2014 Zakalyuzhny L. V. and Lipisivitsky L. V. entered the doctoral program respectively. In December 2017 a candidate’s dissertation was defended by Dmytriieva I. V. In May 2018 a doctoral dissertation was defended be Vasiliev Y. M. and a candidate’s one by Maksumchyk O. L.
“Actual Problems of History and Theory of Drama” is a core interdisciplinary study of the department all members are involved into, working upon its particular aspects. Consequently it became a tradition to host annual international scientific conferences “Brecht’s Readings” and “Drama Readings”. In 2014 by the decision of the department the format and direction of the conference was changed into “Brecht’s Dramatic Readings.” Materials of the conferences are published in the collection of scientific works “Brecht’s Journal” and the student scientific and literary journal “Semper Tiro”. In 2015 the first issue of the journal “Art and Science” came out. approbation of scientific ideas in theater practice. Among various scientific works issues recently several deserve special mention: Bertolt Brecht “Lehrstücke”, “Three epic dramas”, Bernhard Asmuth “Introduction to Play Analysis”, Peter Szondi “Theory of Modern Drama”, Olexander Chirkov “Methaphorical Theatre of Petro Avramenko”, Olexander Chirkov “Stories of Zhytomyr Theatre”, Karoline Hillesheim “Frühwerk von Bertolt Brecht. Lehr werk für Studierende”. Apart from the above-mentioned there have also been published 5 issues of Brecht’s Journal, 5 issues of student scientific and literary journal “Semper Tiro”, 2 issues of the journal “Art and Science”. Since 2011 various international scientific conferences, seminars and workshops are held. between Zhytomyr Ivan Franko State University and the University of Silesia in Katowice (2014). 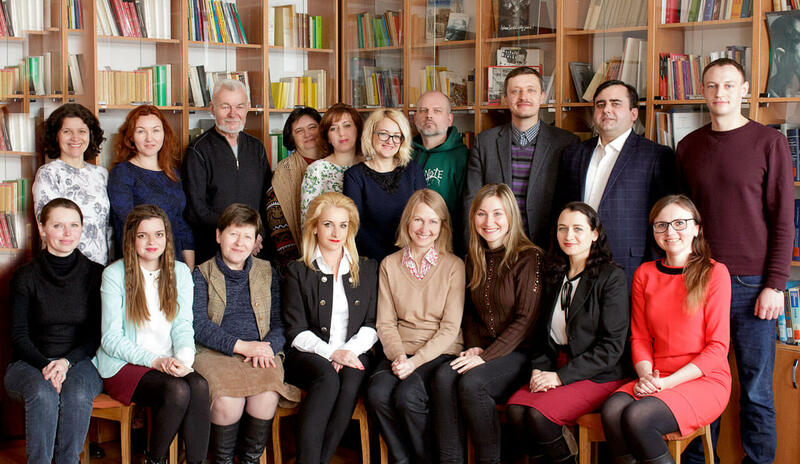 In addition relations with the Brecht Research Center in Augsburg (Germany), the Goethe-Institut in Kyiv, the DAAD Academic Exchange Service, the A und A Cultural Foundation and the Samuel Fischer Foundation (Germany) have been established. The International Theater Institute of Germany, the Scientific and Cultural Society “Epistema” (Krakow, Poland), the Institute of World Literature by M. Gorky, Russian Academy of Sciences (Moscow), Center of German Studies, Institute of Literature. Taras Shevchenko National Academy of Sciences of Ukraine (Kyiv), Free University of Berlin (Germany), Tomsk State University (Russia), Belarusian State University (Minsk, Belarus), Scientific Society “Germanoslavika” of the Czech Academy of Sciences Prague, Kiev Borys Grinchenko University, Cherkasy State Technological University, Yuriy Fedkovych Chernivtsi National University and other universities of Ukraine, Russia, Poland and Germany. In 2012 “Brecht-Zentrum” received a library dedicated to the legacy of the German playwright. The library is considered unique for the Eastern Europe. in the number of more than 1500 books. Among them there are full editions of the works of the German artist, numerous private editions of his works and many literary studies. All of them were donated by Ms. Beata Yeske, a sister of the deceased “authorized Bertolt Brecht on earth” Wolfgang Yeske. He spent 30 years studying the works of the German playwright and poet, and as a Brecht lecturer of one of the most famous German publishing houses “Suhrkamp”, among other initiatives, played a decisive role in preparation and publication of the fully commented Frankfurt and Berlin collection of works by B. Brecht in 30 volumes. Reference book “Dramatists of the twentieth century” (Concept by Chirkov O. S., Managed by Zakalyuzhny L. V.).